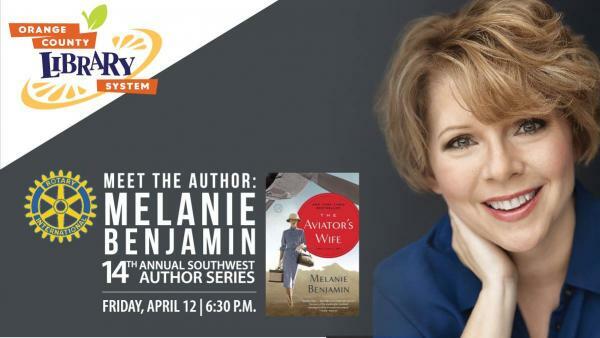 Join us for the 14th Annual Southwest Author Series - presented in partnership with The Rotary Club of Dr. Phillips and featuring author, Melanie Benjamin. Join us for the 14th Annual Southwest Author Series - presented in partnership with The Rotary Club of Dr. Phillips. Melanie Benjamin is the author of the New York Times and USA Today bestselling historical novels The Swans of Fifth Avenue, about Truman Capote and his society swans, and The Aviator's Wife, a novel about Anne Morrow Lindbergh. Her novels have been translated in over fifteen languages, featured in national magazines such as Good Housekeeping, People, and Entertainment Weekly, and optioned for film. Book sale and signing to follow the lecture. The event is free and light refreshments will be served. Doors open at 6 p.m. Registration is encouraged, as seating is limited.